Free Experimental Improvisation by this prolific Swiss artist. 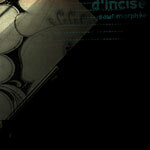 D'Incise is member of the Audioactivity collective from Geneva. In 2002 he started producing different kinds of electronic music, from dub to electronica, dangerously sliding to the more experimental ways of electroacoustic. His world is made with sound fractures, nevralgic crepitations, melancolic atmospheres and a non-dissimulated fascination for rust and faded rhythms. From his meeting with the saxophonist Gaël Riondel and the drummer Cyril Bondi is born "Diatribes", a trio with strong freejazz influences. In an another style, d'incise present a solo live act, closer of electronica, where he operate fluctuations suites of rythmic pulsions, simple melodies and noise waves for a destroyed dancefloor. He also coordinate the insubordinations netlabel, dedicate to improvised music, and collectivly coordinate the audioactiviste netlabel.